Published: Jan. 11, 2019 at 02:32 p.m.
Want to see the numbers behind the numbers? Nick Shook dives into a fresh batch of Next Gen Stats and identifies figures that could shape the Divisional Round of the playoffs. Chiefs DL Chris Jones has been a nightmare for opposing offensive linemen for most of the season -- check the game tape from Week 15 vs. the Chargers -- but he's meeting perhaps his greatest challenge this weekend. Indianapolis features a star guard in rookie All-Pro Quenton Nelson, and a relatively unknown guard in Mark Glowinski, who deserves to be recognized for his play. They'll attempt to combat Jones and the rest of the Chiefs' front. 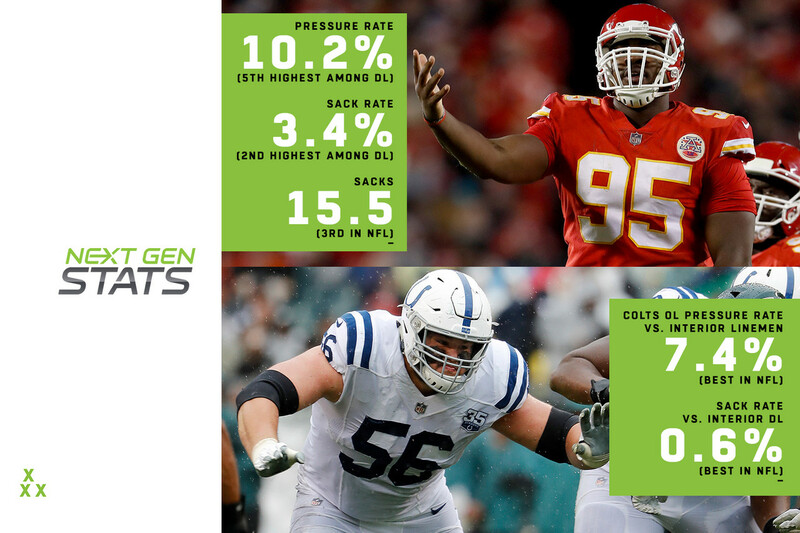 Indianapolis allows just a 7.4 percent pressure rate and 0.6 percent sack rate to pass rushers aligned on the interior (both the lowest rates in the NFL). Jones owns a 3.4 percent sack rate (second-highest among 82 interior DL) and 10.2 percent pressure rate (fifth-highest) this season. Even if Jones is limited, it will take a group effort from Indy, as its tackles will have to keep up their 14.8 percent pressure rate allowed against edge rushers (10th-lowest in the NFL). Kansas City generates the highest edge pressure rate in the NFL at 20 percent. Indianapolis' defense has demonstrated both in on-field play and through advanced metrics that it is designed to allow underneath throws to opponents. The Colts prefer to keep the opponent in front of them and short of the sticks. The Colts have allowed the highest expected completion percentage this season (71.5 percent, 4.5 percent higher than next-closest defense), in part because they're giving offenses what they want, if they don't want a big gain. Opposing passers average 6.5 air yards per attempt (0.3 less than any other team), enjoy 4.1 yards of separation per target (0.4 more than any other team) and take the underneath yards the vast majority of the time, throwing deep on just eight percent of attempts. That will be tested this week by Patrick Mahomes, who has thrown deep on 15.2 percent of his attempts in 2018 (second-highest among 33 qualifying QBs) and has thrown in the direction of an open target on 31.8 percent of such passes (highest rate in NFL). Who cares if the Amari Cooper trade was panned by some at first glance? Dallas' move to acquire the former first-round pick has paid massive dividends for a Cowboys team that went from middling to a favorite pick for an upset playoff win. We've touched on it in this space, but with a Divisional Round game against the Rams up next, we'll return to highlight just how much Cooper has helped Dak Prescott. Before Cooper's arrival, Prescott was averaging less than 3 yards of target separation (2.9), attempting tight-window throws on 23.3 percent of his passes, posted a 62.1 completion percentage, an 8:4 TD-INT ratio and a passer rating of 87.4. Since Cooper arrived, Prescott's average target separation has jumped to 3.6, his tight-window throw percentage has dropped to 14.2, his completion percentage has improved to 70.8, his TD-INT ratio is better (15:5, with six of those TDs going to Cooper) and his passer rating has eclipsed 100 (101.2). It doesn't get much more complete than that. The Chargers are headed to Foxborough for a Divisional Round meeting with the Patriots. Their ability to rush the passer on the edge, which is arguably their biggest strength, will be tested by a New England offensive line that is the best in the NFL against edge rushers, allowing a pressure rate on the edge of just 9.6 percent, even after losing left tackle Nate Solder in free agency last offseason. Los Angeles should still have faith in its duo of Joey Bosa and Melvin Ingram, especially after the latter recorded two sacks in the Wild Card win over the Ravens. Los Angeles had seven total sacks and 17 pressures against Baltimore, both season highs, and Ingram recorded seven stops, four pressures and the aforementioned two sacks for a stop rate of 13.7 percent, the sixth highest by any player in a game this season, including playoffs. Bosa is tied for the most sacks in the NFL since Week 12 with 6.5. Which side will win this battle? We'll find out on Sunday. The Chargers made headlines by using seven defensive backs on all but one defensive snap in a wild-card win over the Ravens, but the Patriots' tendencies indicate that might not work in the Divisional Round. New England uses 21 (2 RB, 1 TE, 2 WR) or 22 (2 RB, 2 TE, 1 WR) personnel at rates that land in the top four (27.9 percent in 21, second-highest in NFL; 6.1 percent in 22, fourth-highest in NFL). These groupings would seemingly force Los Angeles to use bigger, slower players in place of its many defensive backs. But the Patriots are predictable in such scenarios. Running back Sony Michel leads the league in running percentage when on the field (74.8), and when Michel and fullback James Develin are on the field together, the Patriots ran the ball on 82.7 percent of their offensive plays. Taking a more varied approach to deploying them might catch the Chargers by surprise, and make the difference in this contest. With the Chargers deploying seven defensive backs on all but one defensive snap against Baltimore, the Patriots will be tasked with an unusual study in preparing for their Divisional Round meeting. All-Pro safety Derwin James is a key player who makes Los Angeles' defense difficult to predict. James played 59 total snaps against Baltimore and lined up at three different locations: Box safety, slot cornerback and deep safety. The distribution is scattered, with box safety taking the lead (36 snaps), followed by slot corner (14) and deep safety (9). No matter where he lines up, New England must account for James on all downs. Nick Foles is back to create more playoff magic, and so far, it has produced a road win over the Bears. Can he do it again against New Orleans on Sunday? A key to his success or failure might be how he plays against blitzes. The Saints blitz on 31.2 percent of dropbacks (ninth-highest in NFL), achieving pressures on 34.5 percent of such plays. They allow 9.0 yards per attempt when blitzing (30th in the NFL), 14 touchdowns (T-30th) and a passer rating of 104.4 (25th). Meanwhile, Foles is first in the NFL in completion percentage against the blitz (74.5), passer rating (125.7), second in TD-INT ratio (4:0) and 14th in yards per attempt (8.0). Considering these numbers, it's setting up to be a productive day for the hero off the bench.